Ted Kennedy rolled over in his grave today! Thanks to the voters of Massachusetts, Scott Brown has been elected to the Senate seat he held until his death. I'm pretty happy about these election results as President Obama and his super-majority have been quite out of control, so I was trying to think if I had any beers from a Massachusetts brewery to celebrate with. I do love Samuel Adams, but you are not guaranteed to have a MA beer from them. But alas, after I finish my review, I will be tipping my hat and raising a few Boston Lagers to the independent minds of the Commonwealth of Massachusetts. Hey, people from MA, learn to pronounce your R's! On a similar note, I heard a guy on the radio copy my thoughts when he used the "rolled over in his grave" expression this morning. He was speaking about Tiny Tim rolling over after he heard this dude last night on American Idol. My parents used to make fun of the real Tiny Tim, and watching him perform the same song, I can't be sure he was any better than that character last night. You decide. I have one other surprise that I can't wait to tell you about. But guess what? I am going to wait to tell you guys. Stay tuned! 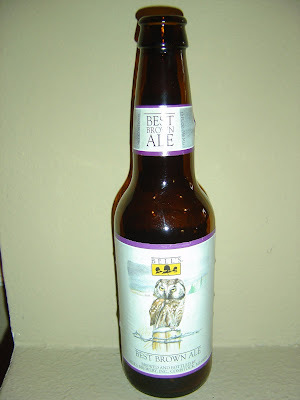 Today I'm drinking Best Brown Ale brewed by Bell's Brewery in Comstock, Michigan. The label says to enjoy this "while autumn takes us on a colorful tour into winter" but that this beer is delicious for all types of weather. Luckily for me, too. South Florida seasons are in name only, despite our one week of cold weather. And colorful, yes, if green trees year-round is up your alley! The box where I expected to see a batch number like usual for Bell's beers was noticeably empty. Sweet, malty aroma with a touch of cinnamon and raisins far off in the distance. Pretty nice aroma. Malty flavors to start. And HIGH carbonation. Nutty, roasted flavors are the most prominent. The beer is slightly sweet before some hops come in and bitter it up. A fruity progression in the background brings forth this sour-ish flavor that lingers on for the rest of your experience. Low to medium body and the prickly carbonation are no match for each other. Not a great mouth feel at all. You end with a dry and bitter finish. Not a favorite. If you call yourself the "Best" anything, you'd better bring it! This beer did not. I have heard good things about this brewery even though I have never even seen them anywhere. Too bad this beer is lame. Are they the ones that make Hopslam? I heard that is pretty good. Yes, these are the guys that make Hopslam. We don't get that one down here (at least not yet) but have five or six. Although this wasn't great tor me, most of them are really good. A bunch of Stouts, too.